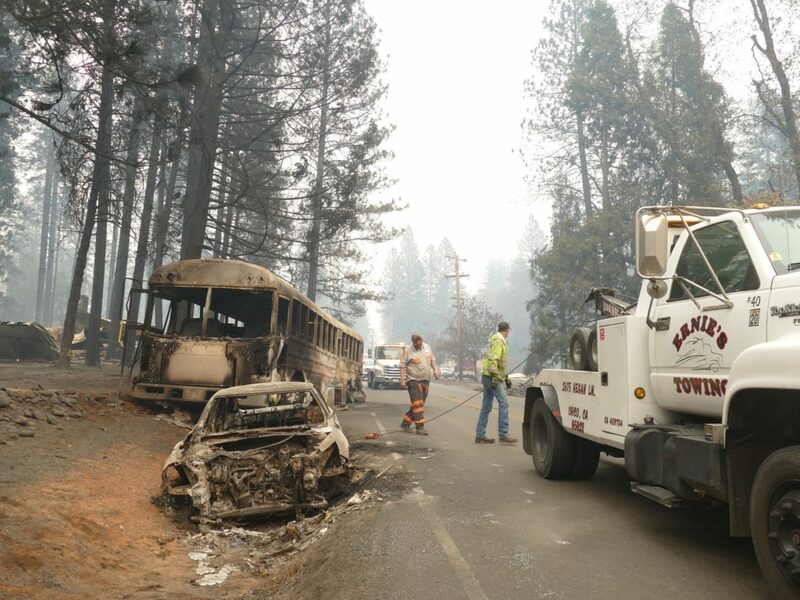 Burnt out cars and a bus are removed from the roadside after the Camp Fire destroyed the town of Paradise and surrounding communities. They can’t dwell on what the fire has taken from them, or the losses still to come. So they focus on Dec. 3. That’s the day people responsible for the Paradise Unified School District want school to be back in session. When that day arrives, it will have been 25 days since Nov. 8, the day the Camp Fire decimated the town of Paradise and neighboring communities, claiming at least 79 lives and consuming more than 10,000 buildings. The wildfire, the deadliest in California history, either destroyed or badly damaged all nine campuses in Paradise Unified along with six charter schools. At latest count, some 700 people were still missing. Since early last week, administrators, teachers and staff have been working out of makeshift offices in the city of Chico. Their first order of business has been locating the families of the more than 3,500 Paradise Unified students to confirm that they survived the fire, find out if they lost their homes and get a sense of their plans going forward. As of Wednesday, they’d reached nearly 90 percent of the district’s students and none have been reported among the dead, said Butte County Superintendent Tim Taylor. But no one can be certain how many students will actually show up when classes resume, or where. The students worrying officials the most are those who were already marginalized and living a transient existence, said Dena Kapsalis, principal of Honey Run Academy, a community day school that was destroyed in the fire. Marc Kessler, a science teacher at the 600-student Paradise Intermediate School, said he and other teachers and administrators have been able to confirm that 90 percent of that school’s students lost their homes. Families are living in hotels, trailers, tents, he said. Kevin Moretti, president of the Chico Unified Teachers Association, described the effort as “organized chaos.” As of now, he said, 150 students from Paradise have enrolled in Chico schools and are expected to start school when classes resume. These and other displaced students are covered under the McKinney-Vento Homeless Assistance Act, a 1987 federal law that, among other things, allows students who are homeless to enroll in school without having to show proof of residency or immunization records. But Chico Unified can’t handle everyone, not even close. So, Taylor and other officials have spent much of their time this week scouring Chico and the surrounding area for classroom space. Taylor said Paradise Unified in the immediate term will be a “hopscotch” of classrooms housed in portables and vacant commercial buildings. He said they are close to securing two large vacated retail stores that can be converted into classrooms. The Veterans Resource Center is accepting monetary donations for veterans and their families online or at its center at 10 Amber Grove Drive, Suite 114, Chico. It also is accepting items from a list, including new clothing, personal hygiene products, gas cards, gift cards and blankets. The California Community Foundation Wildfire Relief Fund is collecting money for victims of all of California’s wildfires. Donations are being taken on the organization’s website or by sending checks to the California Community Foundation, 221 S. Figueroa Street, Suite 400, Los Angeles, CA 90012. The Enloe Medical Center, based in Chico, has set up the Enloe Foundation Camp Fire Relief fund to help caregivers, patients and families who have lost their homes or been displaced. Tri Counties Bank, which has a branch in Paradise, is taking donations at all of its other branches and through a GoFundMe account. The bank donated $25,000. The money will be distributed through nonprofit emergency relief agencies, according to the GoFundMe page. Butte Humane Society, 2580 Fair Street in Chico, is accepting dog and cat food, litter boxes, kennels, carriers, leashes, toys and other pet supplies. They have an Amazon wish list. Yuba City/Sutter Habitat for Humanity is collecting donations online and at its ReStore at 202 D. Street in Marysville, CA 95901. Thrivent Financial has pledged to match monetary contributions of up to $250,000 to help evacuees from the Camp Fire, according to the website. Used and new bedding is being accepted at the Dorothy F. Johnson park and recreation center, at 775 East 16th Street in Chico, where some evacuated families are staying. Donations also continue to be taken at shelters with many in need of sterile gloves, hand soap, bleach and disinfectant wipes, among other things, according to a resource page set up for the Butte County Office of Education. Sonoma County Fire Relief is accepting monetary donations for Butte County Fire Relief through its website. North Valley Community Foundation is collecting monetary donations and gift cards and helping to match evacuees up with rental housing. Its board offers grants to individuals and organizations helping with fire relief. Checks can be sent to: NVCF Camp Fire Relief, 240 Main Street, Suite 260, Chico CA 95928. Gift cards can be sent to Sierra North Valley Realtors, 1160 E. 1st Avenue, Chico, CA 95928. The Golden Valley Bank Foundation is coordinating the collection of funds, including the Schools Fire Relief Fund, set up by the Butte County Office of Education. Donations can be directed to a specific school district or a specific use, or can be left open. Unspecified donations will be dispersed proportional to the number of students who lost homes in each district, according to the County Office of Education website. The Chico Unified Teachers Association has set up a Camp Fire GoFundMe fundraiser for teachers and students in the Paradise/Chico area. The organization also will accept checks sent to 819 E. Fifth Avenue, Chico, CA 95926. Making sure those students who return end up together is a top priority, Taylor said. He envisions a school community of portable classrooms situated somewhere in the county and has made a nationwide plea for donations of portables. Taylor, along with others, are also worried about “victims teaching victims” when teachers return to classrooms. He talks about the need for mental health “strike teams” that can be on hand for teachers who need emotional support. Moretti said 250 members of the California Teachers Association lost homes in the fire, and has asked members of the Chico Teachers Association to offer extra rooms in their homes to their fellow teachers from Paradise. 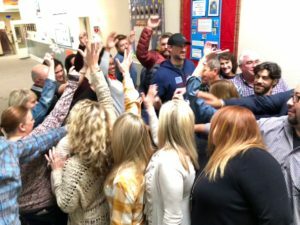 One thing teachers won’t have to worry about is their paychecks, as Taylor expects the state to waive Paradise Unified’s attendance requirements for up to two years. California schools are funded based on their average daily attendance (ADA). Without a waiver, the district would be facing a crippling funding cut corresponding with the attendance drop and be forced to lay off many teachers and staff. Additionally, officials with the California Department of Education, the Office of Emergency Services and Gov. Jerry Brown’s office are preparing an executive order providing more waivers to the state’s education and building codes that will help Butte and other counties to get students and teachers back to school as quickly as possible, according to state sources. Simultaneous with the efforts by Butte County and Paradise Unified officials, California’s charter school community has rallied around the six charter schools in Paradise that saw their campuses either destroyed or badly damaged in the fire. The schools serve more than 800 students in and around Paradise. On Tuesday, a team of charter operators and representatives from the California Charter Schools Association met in Chico with Paradise Unified and Butte County officials to collaborate on a plan for the coming weeks and months. Like their counterparts in Paradise Unified, charter officials are scrambling to make contact with their students and find places to school them. Although the search for facilities is a struggle, it’s something charters have plenty of experience with, said Caity Heim, a spokeswoman for the charter schools’ association. Paradise charter school operators rally together during a meeting in Chico. Photo by Caity Heim of the California Charter Schools Association. One of the schools, CORE Butte Paradise Center, already has a location in Chico thanks to a new campus that is near completion. The charter schools are also targeting Dec. 3 as their re-opening date, but realistically it might not be until January, Heim said. Among the more high-profile donors is Sierra Nevada Brewing Co. It has started the Sierra Nevada Camp Fire Relief Fund with a $100,000 contribution. It plans to raise more funds by brewing “Resilience Butte County Proud IPA” on Nov. 27 — #Giving Tuesday — and releasing it on draught and in cans in January, said Robin Gregory, the company’s spokeswoman. One hundred percent of the proceeds will go to fire relief for victims of the Camp Fire, she said. As of Tuesday, 300 breweries across the country had accepted Sierra Nevada’s invitation to help brew the beer and the brewery’s hops and malt distributors have agreed to donate much of the ingredients, Gregory said. The brewery also will team up with the Town of Paradise, Chico State, local school districts and World Central Kitchen, a nonprofit started by celebrity chef Jose Andres, to serve 15,000 meals to survivors of the Camp Fire on Thanksgiving Day. The food will be prepared by top chefs, including Andres and Tyler Florence, and Paradise restaurant owners will prepare the food for Thanksgiving Together, according to the World Central Kitchen website. Heim of the charter schools’ association said the efforts of Sierra Nevada served as inspiration to their group gathered in Chico. Editor-At-Large John Fensterwald contributed to this story. David Washburn writes about school climate and discipline issues in California. Diana Lambert is based in Sacramento and writes about teaching in California. A previous version of this article incorrectly stated Marc Kessler's position with the Paradise Teachers Association. That is really an amazing post. I loved reading it. thank you for sharing! The devastation that this fires bring is unbelievable. Thank you for the supporting article. Hello from the town of Clayton! I graduated from Chico State many years ago and spent many years in Paradise. Due to an accident, I can no longer teach. I have retired on Disability Retirement. I have file cabinets, books, storage items, classroom items and would like to donate them to any teacher or grade level to use how they would find most useful. If this is something that anyone would be interested, please feel free to get in touch. My materials and supplies can be used across K-2. Not new but have a lot of life left. Many thanks for considering to let me help the only way I can. I would also load up and bring to Chico or Paradise. Thank you and my very best during your chaotic time. Thank you for your report. Very informative and detailed. Please know that there are one to one gifting for individuals and families via the Facebook groups Butte camp Fire victims Adopt a Family, Paradise Adopt A Family and Needhub. The Power of One is strong. Is there a local place where I can donate clothing to get to the fire victims north of where I live in Sebastopol, CA?